Naples has a great beach (periodically widened) which has unusually white sand and a variety of shells. The beach has public access at every street. 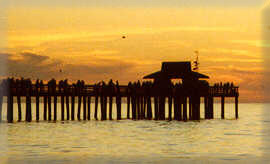 The Naples Fishing Pier is over 1000 feet (300m) long and features a shop selling snacks and bait. Head boats are available to take fishermen to the Gulf for half-day and full-day excursions. Boats may also be rented for use in Naples Bay and other inland water as well as in the Gulf. Naples has a variety of upscale shops in the 13th Avenue South area as well as in the original Fifth Avenue South area. There is also a typical American Mall (Coastland) on US41. Tin City on US41 at Naples Bay has numerous boutiques and waterfront restaurants housed in old tin roof buildings. The Naples Downtown Art Festival is a major event held annually on the weekend following Christmas. Almost the entire length of Fifth Avenue from US41 to the beach is filled with hundreds of booths selling every imaginable art item from carved ostrich eggs to major sculpture. Naples National Art Festival is held in February in nearby Cambier Park. Wildlife is a major theme in the Naples area. Naples Zoo at Carribean Gardens has been amazing visitors with its animal collections for 50 years. Nearby Corkscrew Swamp Wildlife Preserve allows visitors a closeup look at Florida flora and fauna in the wild including (usually) alligators and bald eagles. Boat excursions for shelling are available in Naples and airboat or swamp buggy tours through the Everglades are available in Everglades City. For those interested in gambling, there is dog racing at Naples/ Fort Myers Greyhound Park just north of Naples in Bonita Springs. In addition, the Seminole Indians operate a casino in Immokalee. Naples has a definite international flavor. One can often hear German, French, or Spanish being spoken and the local bookstores carry Die Welt. Naples has air and boat transportation (via Marco) to Key West. Here is the Naples Weather Forecast from SeekOn. If you are in the frozen North, read it and weep! If you are a fisherman or boater you may want to see the Naples tides for today. SeekOn Naples City Directory -- More on Hotels, Eating, Real Estate, and Entertainment.